Hackers does a great job on their ratings, and I have always found them to be quite reliable and on point. This rating was not only shown online, but is proudly displayed at the course at Whispering Springs. 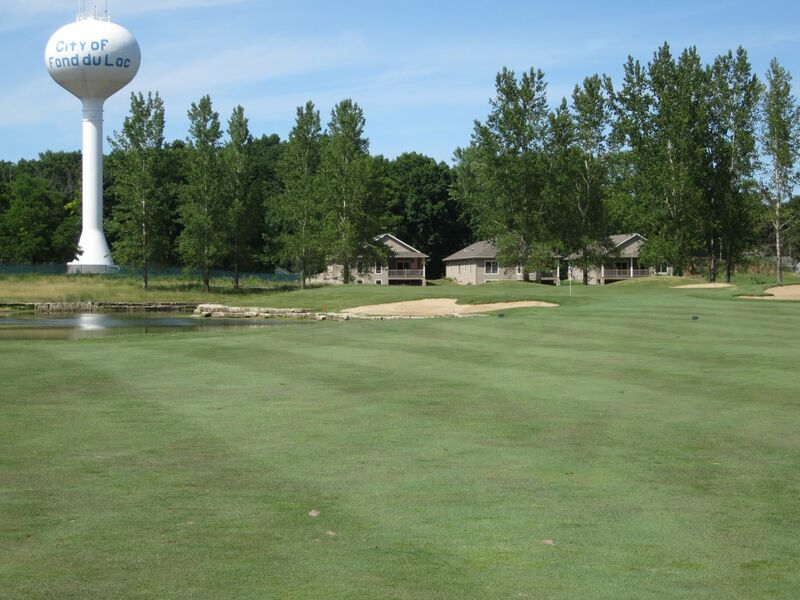 My brother’s father-in-law is a bit of a golfer in the Fond du Lac area, and has often talked with me about Whispering Springs as a great course that has come a long way in the past few years. 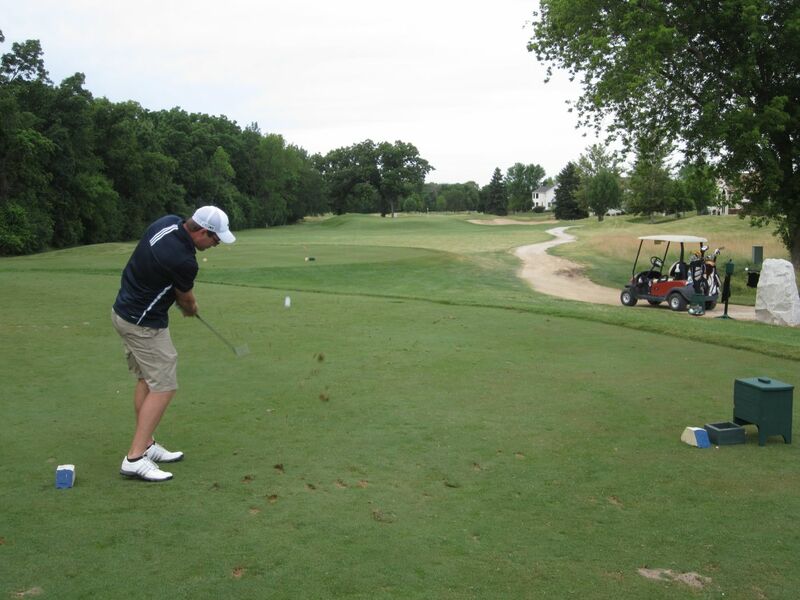 A recent renovation of their clubhouse took place in 2009, resulting in a beautiful facility that overlooks their opening and finishing holes. Whispering Springs has a nice practice facility, with a chipping green, putting green and a number of target greens to aim at. 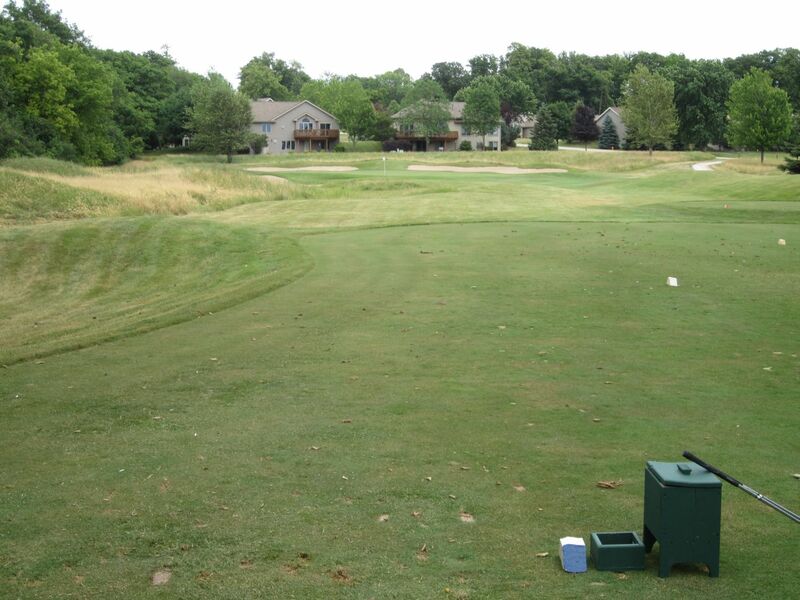 I used this area pretty extensively prior to our round, and the grass was very nice to hit off of. The first hole at Whispering Springs is pretty straight-forward: A par four with a tree line left and property line right. At 405 yards, this is one of the longest of the par fours on the course, but if the fairway is found is not very difficult. The second is the first, and longest, of the course’s par fives. 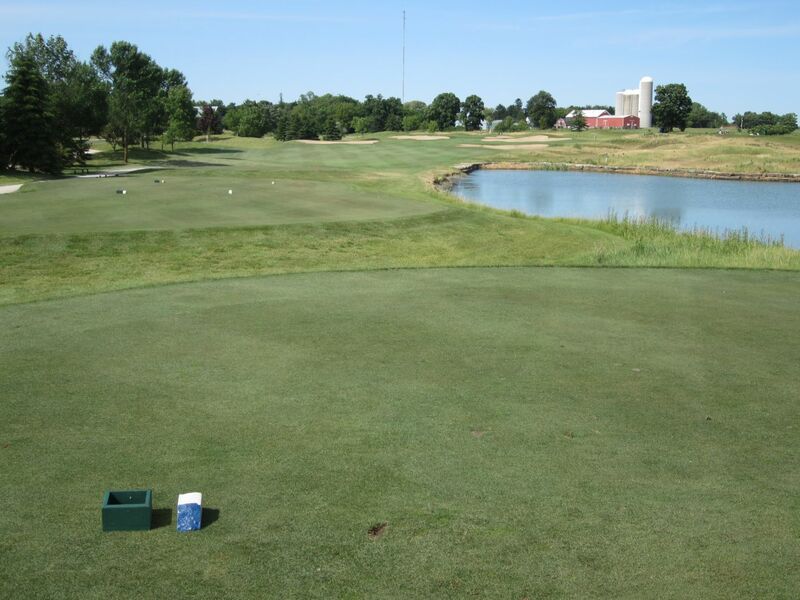 At 563 yards from the blue tees, this is a three-shot par five that finishes over water and before the Fond du Lac water tower. This is a really pretty green area with a large pond left and sand short left and right. Three is the first of the par threes at Whispering Springs, and one of the most subtly difficult. 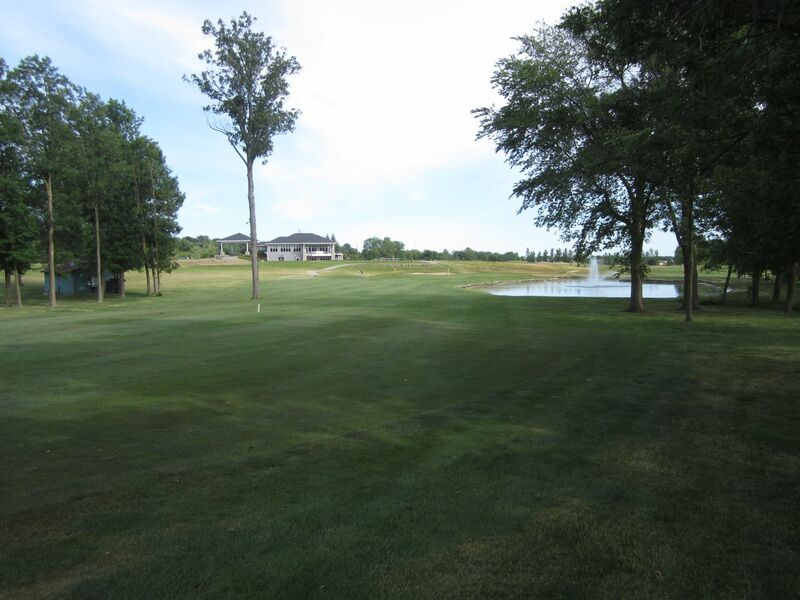 Do not fire long on this hole, as the back side does not have sand, but worse has a deep hollow that must be played out of to a downward sloping green that runs toward the pond that fronts it. 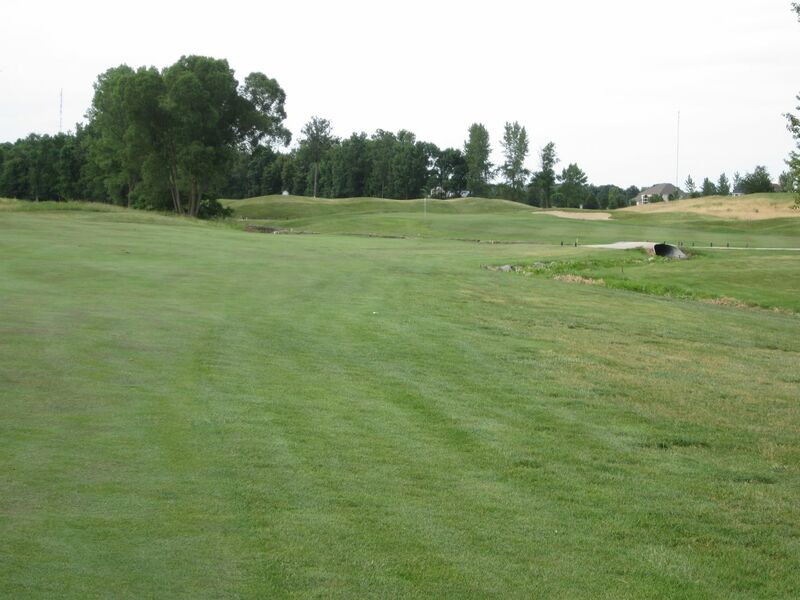 A small creek meanders through the fourth hole, a mid-range par five that measures 491 yards from the blue tees. 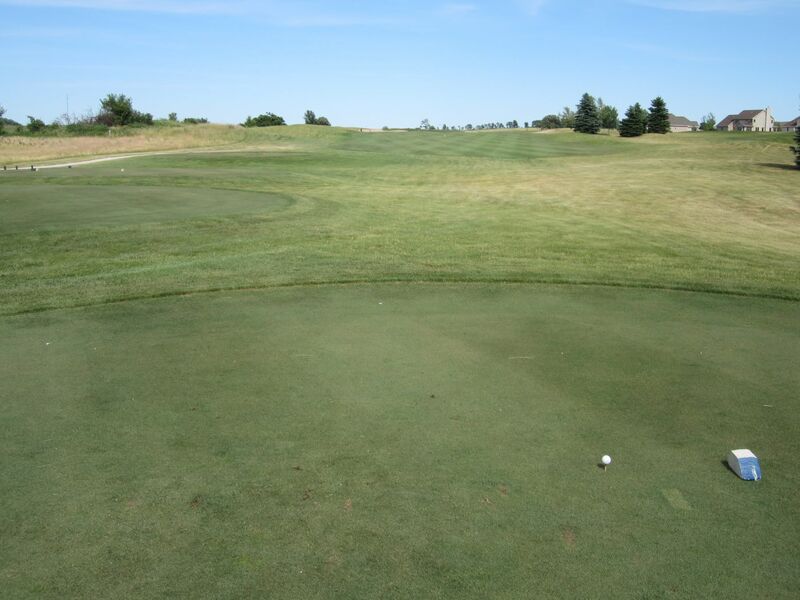 The fairway is quite hittable, and played from a slightly left angle. 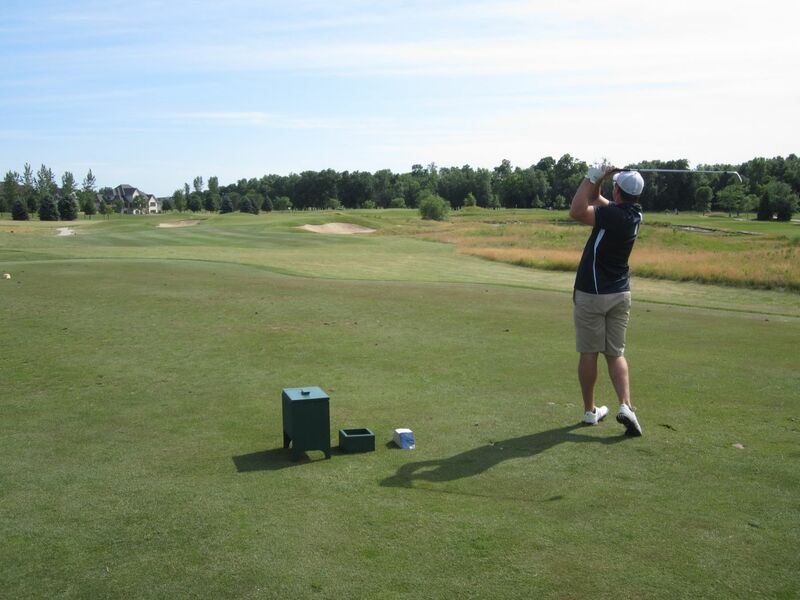 The fairway traps are very much in play, and will make the second shot considerably more challenging. The hole finishes with a highly elevated green with an extremely slippery break. 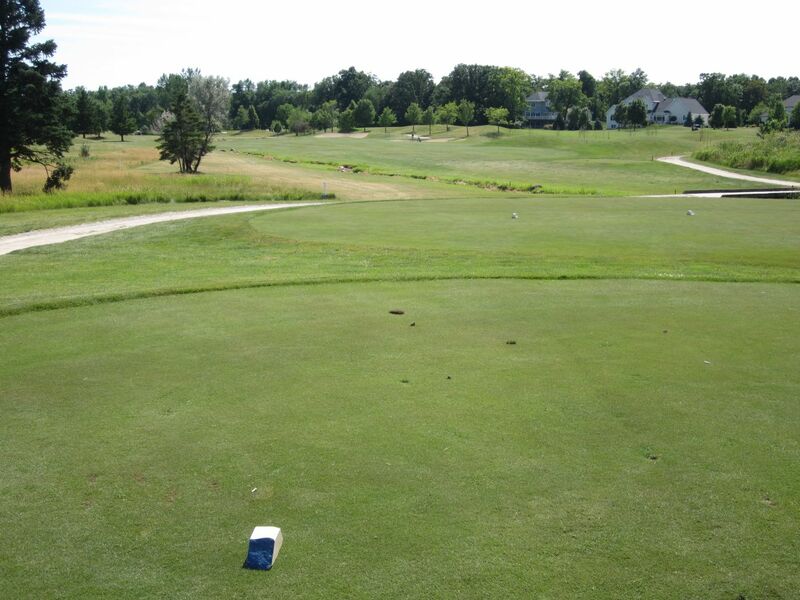 Five is littered with fairway sand traps, and plays over a large pond on the right side. The pond does not come in to play, but the bunkers continue around the green. 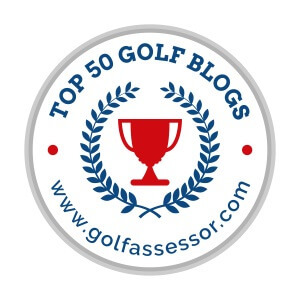 I found one on the drive, and had a tough 150-yard shot to the green complex. 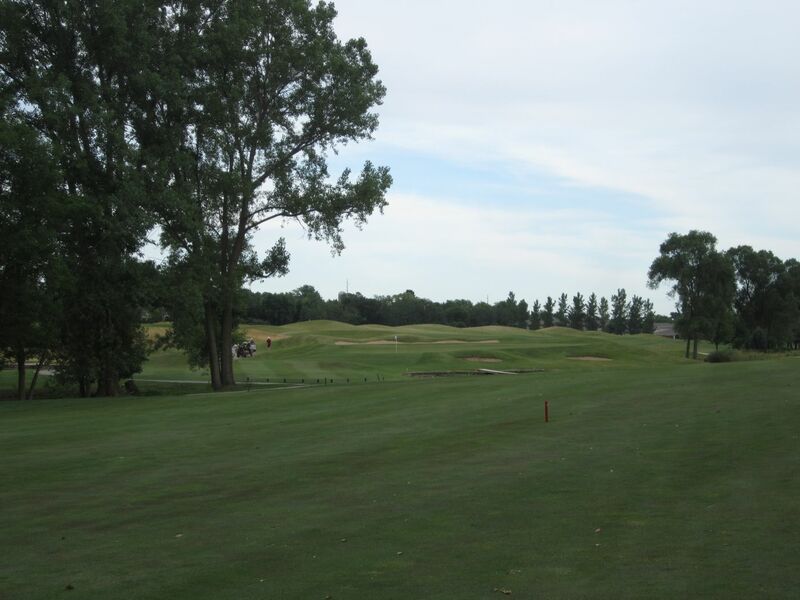 Six is a par three with an elevated green and huge traps bordering the left and right sides. Other than that, it is pretty simple, although on the longer side with a fore wind that required an extra club or two to hit. Seven plays to an elevating fairway that makes for an almost blind tee shot. The landing area is largely open, though, so bombs away on this hole for a short shot to a risen green. Eight plays back downhill, and is best attached from the right side of the fairway to avoid the monstrous greenside bunker that fronts the left side of this huge putting surface. Nine is one of the most demanding tee shots on the course. Bordered on both sides by trees, play a draw if you have it in the bag. 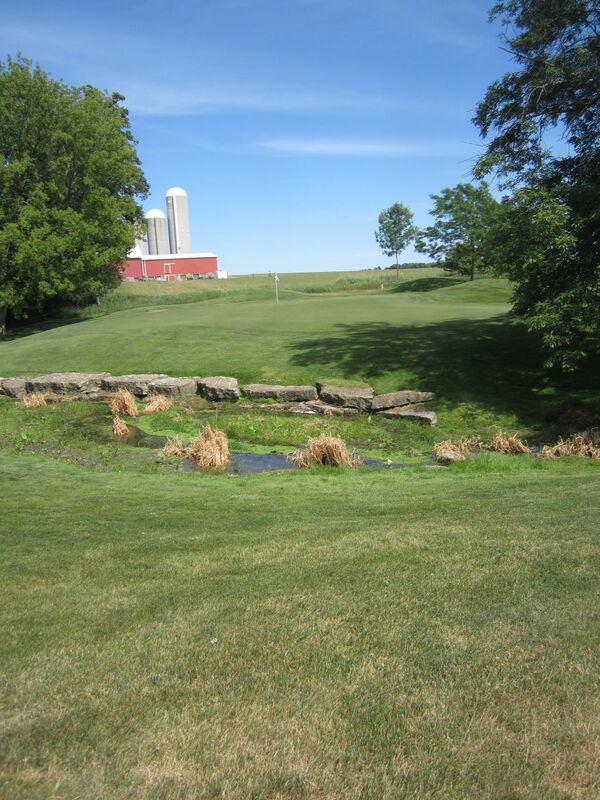 The lone tree in the middle of the fairway is a great target off the tee, and the hole finishes to the left of a beautiful water feature with a tall fountain. 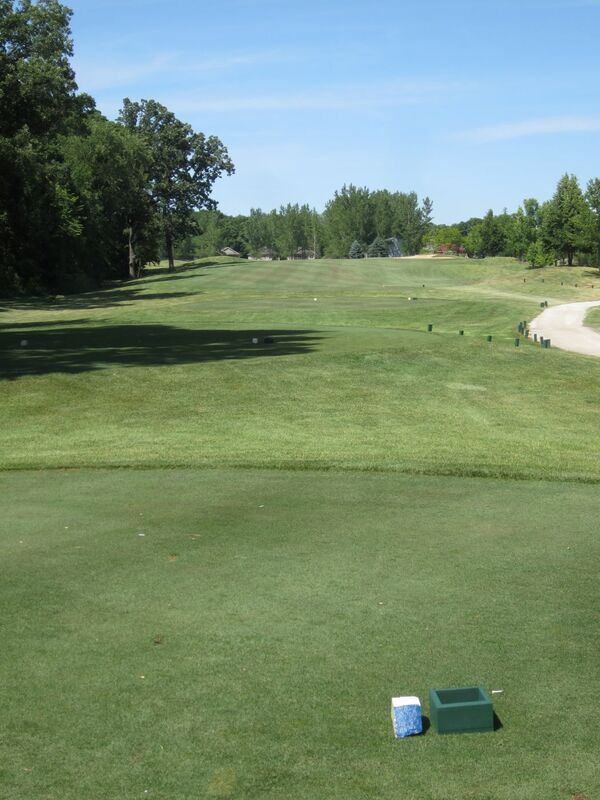 Ten features an easy tee shot with a demanding finish. 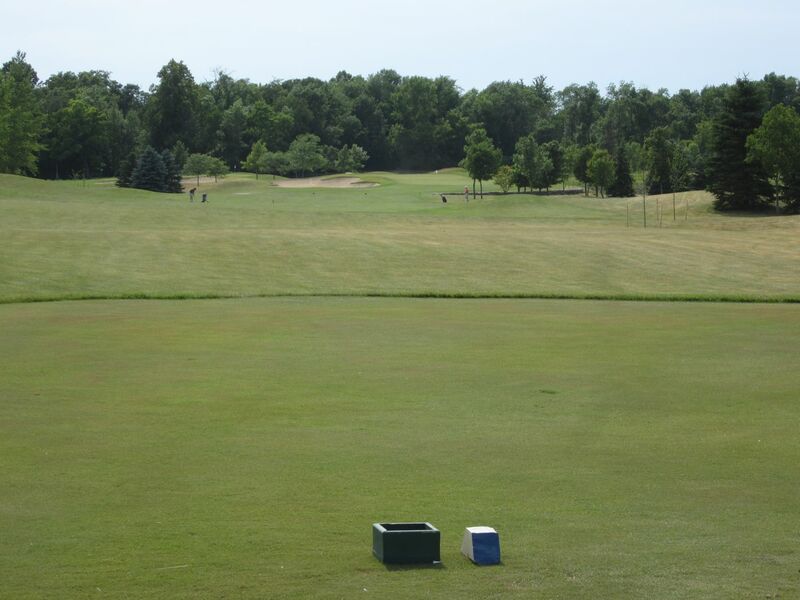 At 500 yards, play the drive to the left side of the fairway to stay clear of the tree line right. 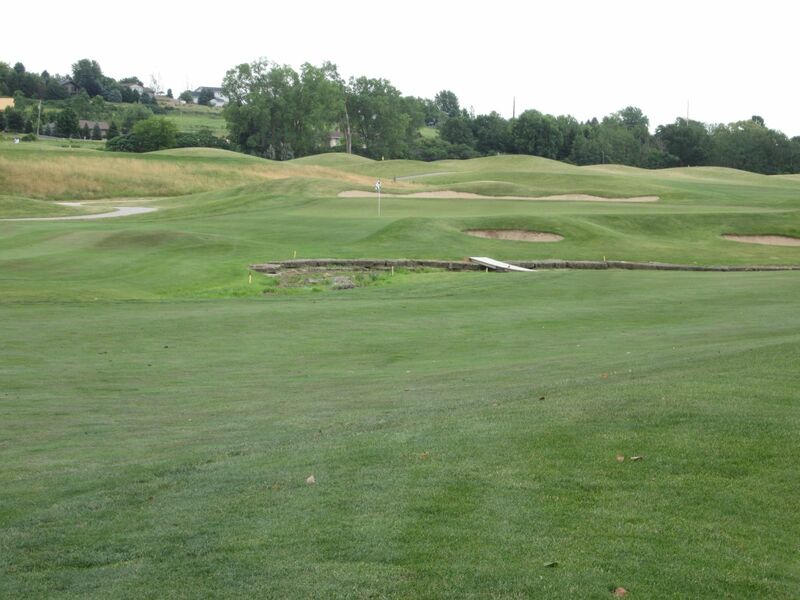 The approach is played over a rock wall that leads to the green. 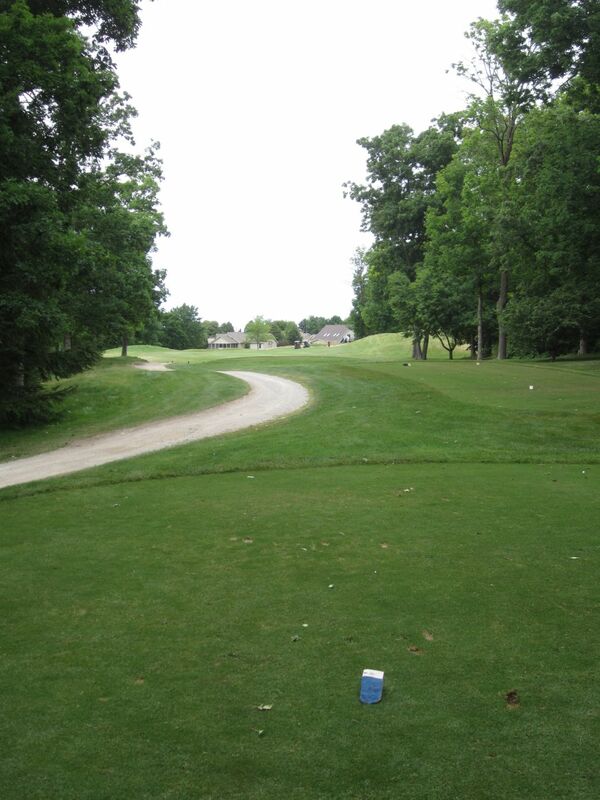 Eleven was my worst drive of the day, when I actually hit a condo that is at least a hundred yards off the fairway. After apologizing to the owner and dropping, though, I was able to put a nice six-iron to the backside of the green to save the hole. 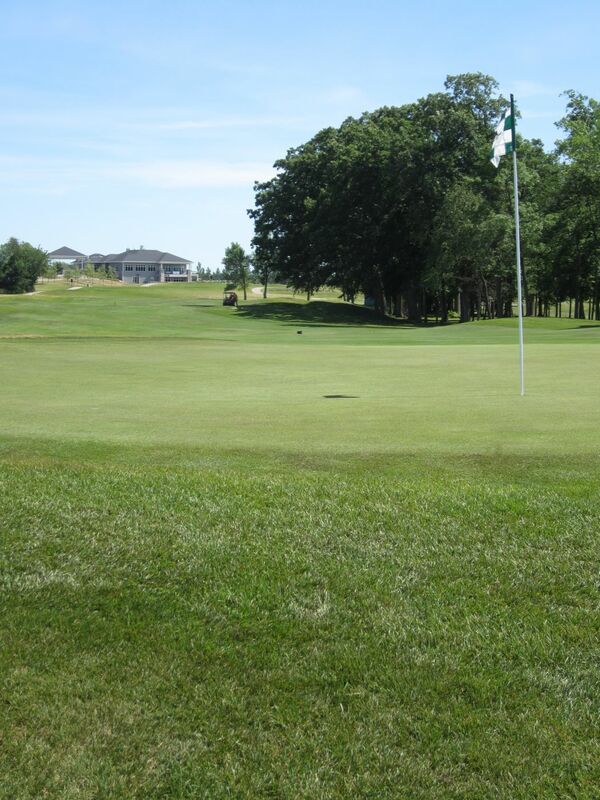 The green plays over a creek and is slanted heavily upward from front to back. Crossing the street to twelve is one of the most majestic views on the course: A huge downhill drive with property lines right and a wide, accessible fairway. A front hole location broke completely opposite of what I’d expected. Even after hitting several “player-two” putts I still had no idea how it broke the way it did. This is apparently a really tricky green. 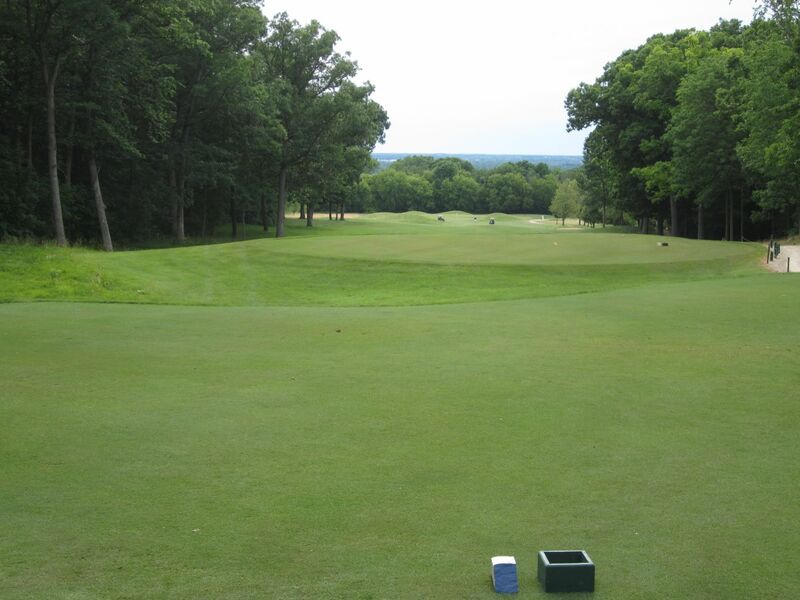 Thirteen is a long par three that is bordered by woods on the left. At 184 yards from the blue tees (225 from the back), this is the longest of the par threes at Whispering Springs, with a green that is perched well above the approach area. Fourteen is an interesting par four, and parts of it actually reminded me of holes at Brown Deer or the Wisconsin Club. The woods on the left side of the fairway encroaches significantly following the tee shot, and is entirely out of bounds. The neighborhood property line runs the right boundary of the hole, making for a demanding tee shot that should be hit with less than driver. After the woods juts fairway-ward from the left, the approach is played to a narrow area that has a handful of sand traps on the right side. This is a tough golf hole. Probably my favorite par three on the course, fifteen is just 146 yards with one of the largest greens on the course. 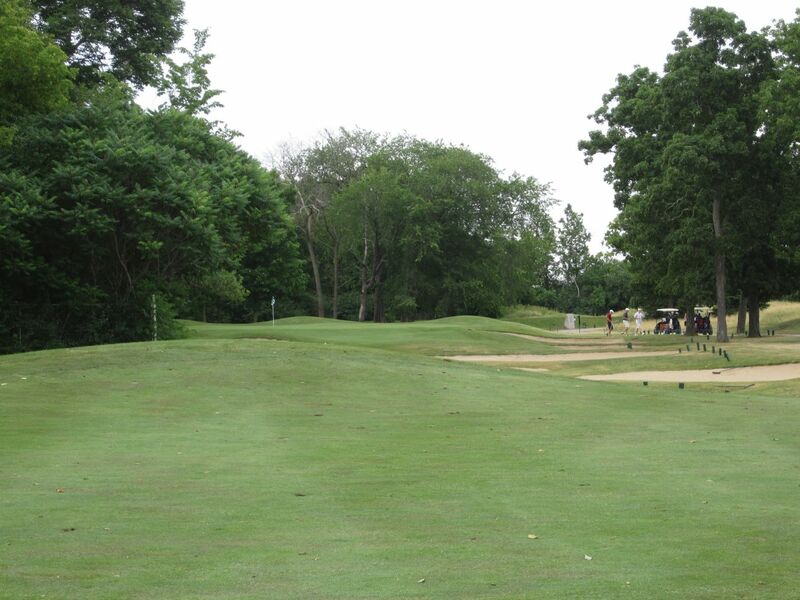 Huge sand traps surround the green area, so choose the right club and find the green for your best chance at par. Sixteen is the second longest of the par fours at Whispering Springs. At 416 yards from the blue tees, all systems are go for long drives here, but the scary part of this hole is the green area. The left side is heavily beached, while the right side drops off straight downhill and will make for a very delicate approach. 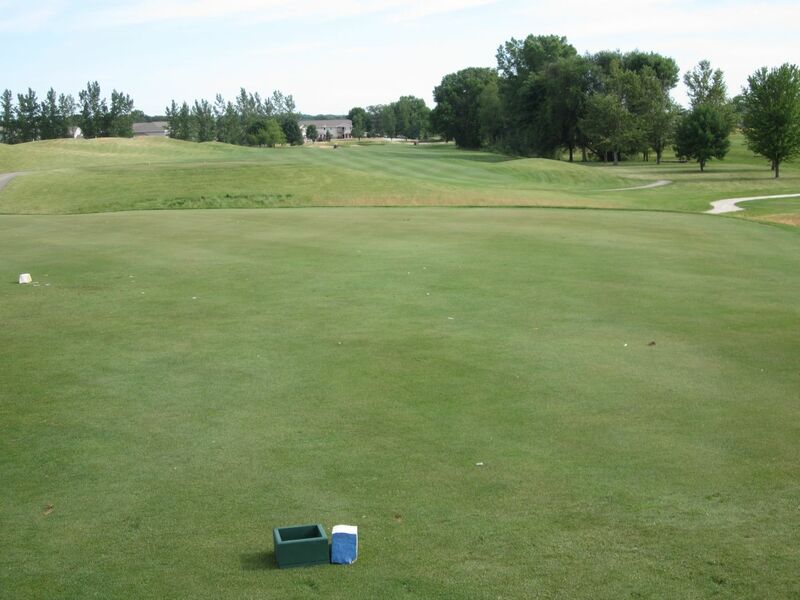 The green is well above the head on any short chip, and is quite small and heavily sloped. The tee shot on seventeen is a bit claustrophobic. 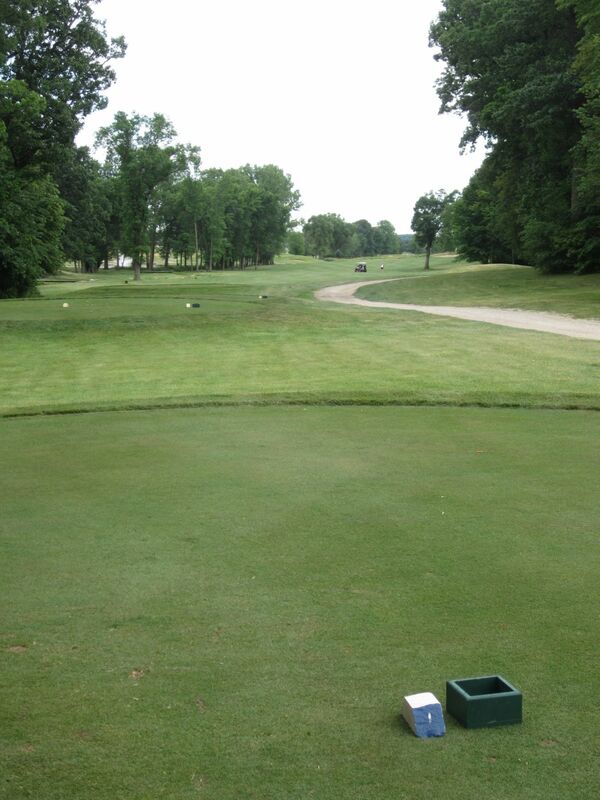 With woods on both sides, the hole doglegs to the right and uphill a bit over 200 yards out. 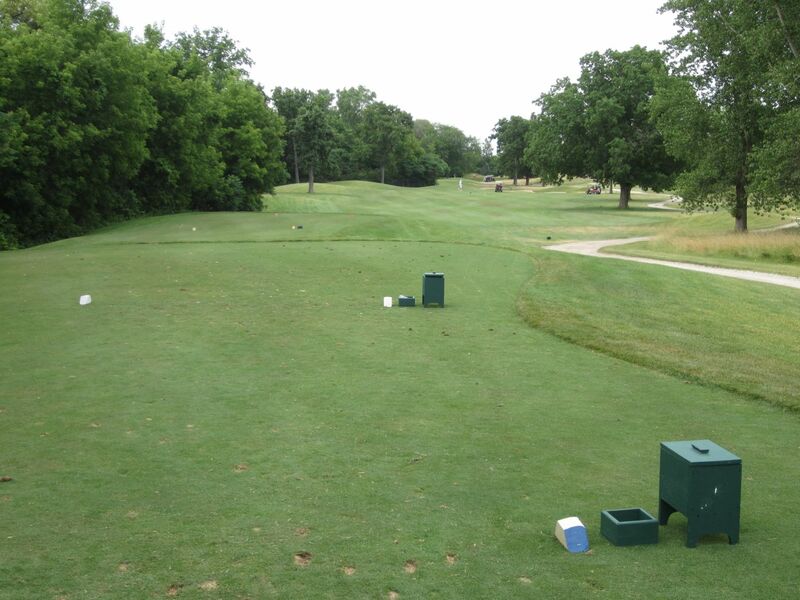 Fairway traps are found long of the driving area, and anything short will leave you laying up for a clean shot to the green area. 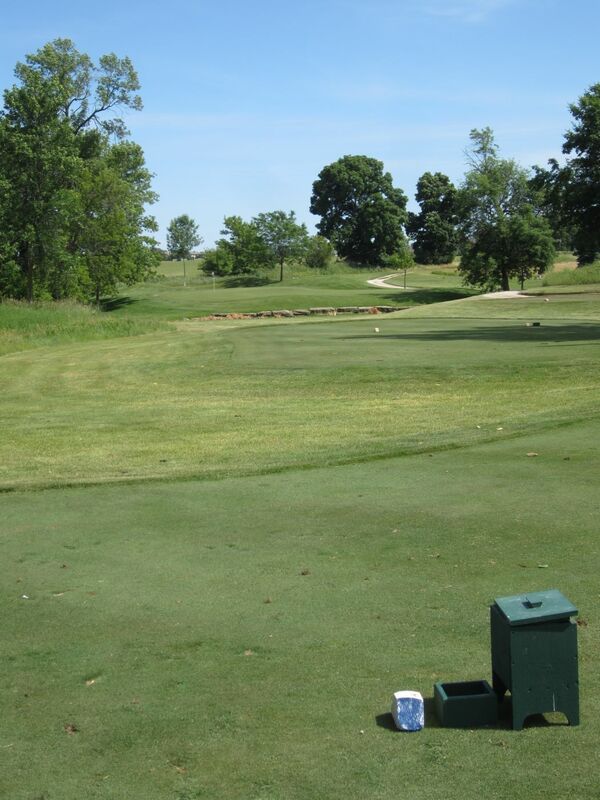 Anything driven left will be played from a lower surface (or the sixteenth hole fairway). The green is risen significantly from the fairway, and is well-guarded by trees and more sand traps. Eighteen is a beautiful finishing hole. With trees on both sides, the second shot will almost always be long and laid up short of the creek that crosses to the green. 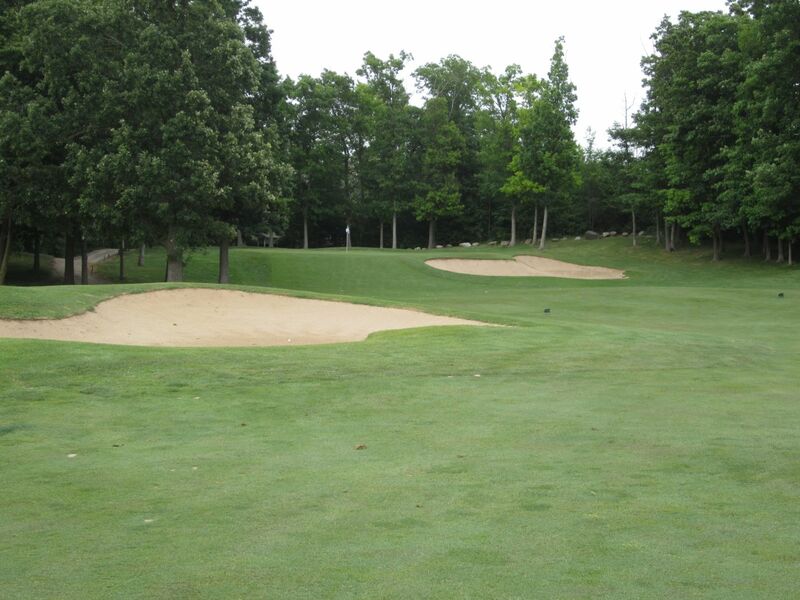 A spattering of mounds and pot bunkers surround the green, and a false front on the left side forces an approach to the center or right side of the putting surface. With a peak season rate of $53, including cart, I agree with Hackers Central that Whispering Springs is the best value to be found in the state of Wisconsin (without considering special rates, promotions, etc.). Just under an hour from the Milwaukee area, I implore you to check out Whispering Springs. 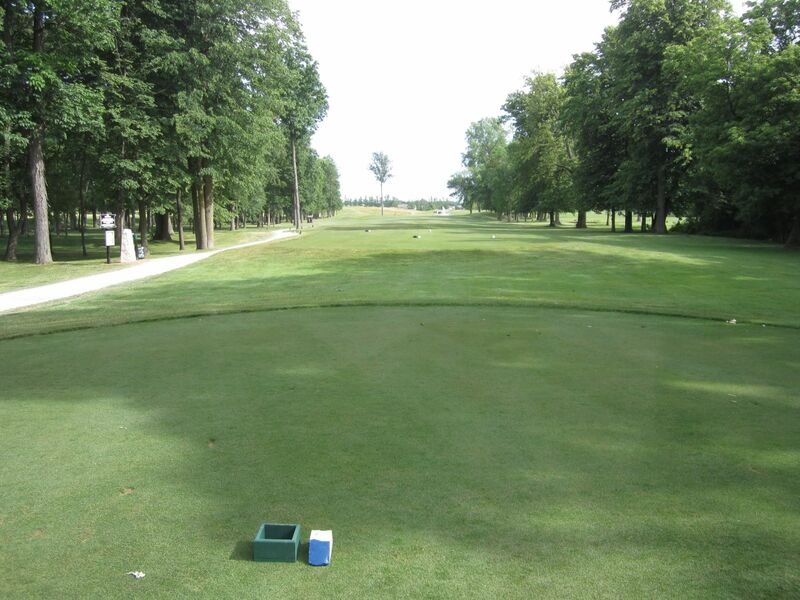 The conditions, layout and variety of holes, and the wonderful hospitality found here are all exceptional, especially given the fantastic rates they charge. I was absolutely satisfied with the experience, and can’t believe it had taken me as long as it did to discover such a wonderful track.